This is Minnesota Rail, a SAM designed for one player. It features some new Goods, Industries, Traincars and Engines. It covers the period from 1950 to 2010. It plays on a 17 x 17 map and runs in two eras covering the 60 years. Time has been slowed. Please view the Read Me file for more information on playing this map. Version 2 corrects a few minor typos. Game play is unchanged. Hello Slider38. I just got back from an out of town trip and was thrilled to see you have a new map for us. I have been enjoying your map this evening. It is wonderful Thanks for all you do for us. It is much appreciated!!! Thanks for the feedback. Glad it ran ok for you’all. Starting a new map and making some progress. Thanks again. I like the map, but it crashes the game for me after about 20 minutes playing. Still, keep up the great work. Mulligey, one thing you might try – open the RRT_Goods.xml file in whatever xml editor you use and simply resave it. Sometimes the file date simply needs to be updated and resaving the file will do that. That probably isn’t going to help as the date problem with the goods.xml file normally causes an immediate crash, but with this game, you never know. I would not think you would have a memory issue with this map, but that’s another possibility. You might try turning down the graphics and see if that gets you further along. If it does, then you might need more free ram. Perhaps turning off some programs running in the background would help. Hi Slider, I did the resave with everything and still got a crash about 30 mins in. RUnning on a Mac on os X 10.10 with 16gb of ram. 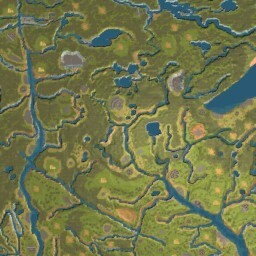 I know this is probably the wrong place to ask this, but does anyone know how to make Borneo Island map work? Last I knew was it only worked on Windows XP, but I was wondering if anyone had gotten it working for later versions of Windows. I wish I could help, but I know nothing about a Mac. I’ve never owned one and I don’t know what differences might exist in game versions. But thanks for giving it a try. Slider, same for me on a mac. Game crashes when train reaches any second city. Thanks for giving it a try Igor. I guess it is just not going to work well on the Mac operating system. Sorry for the trouble. I posted a new map in the maps in development forum – The Union Pacific. Perhaps you could give that a try. A number of folks have tried it on Bobby’s site. I have not seen any feedback here, but it has been downloaded by several folks. Maybe that one will work for you. Well, SMR is pretty much dead, is there anyone else still playing it? There absolutely are. You should look at Bobby’s site. New posts almost daily. Folks building maps. I’ve just started my next one. Go here http://www.sidmeiersrailroads.net/portal.php and register. Lots of game info, building blocks for engines, goods, etc. Unfortunately, this site is just not monitored anymore. I think Warll shows up once a month to see if anything is going on. That’s about it. Bobby’s site is monitored constantly. Try it. Plus, tons of tested maps. Igor, you might try opening each xml file and then just re-save it, which updates the date on the file. This game seems quite hung-up on dates and this re-save often solves the problem, at least on windows pcs. It would be worth a try. I play SMR every week. I look forward to ANY new map produced by Slider38 or anyone else. Thanks again Slider38 and anyone else who has submitted maps for my playing pleasure! Glad you tried it Gary. I’ve got a new one in the works, but it will be a while yet. Just don’t have the time in the golf season to get too much work done on it, but it is slowly coming along. Thanks again for giving it a try.